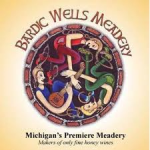 Michigan’s first licensed meadery. A meadery is a winery that makes only honey wines. Mead is the original alcoholic beverage that predates beer and wine.